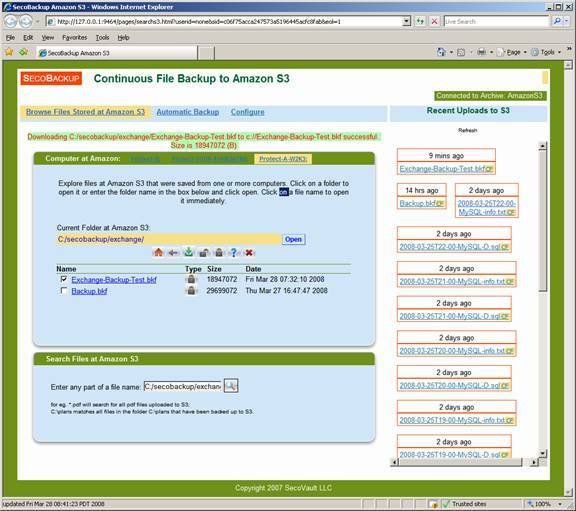 SecoBackup is a secure and automatic remote backup service for Microsoft Exchange and other Windows Server Application Backup to Amazon S3. It's simple to install and configure. Simply download and install the SecoBackup client, setup exchange to back up into a local folder that SecoBackup expects, and you're set to go! SecoBackup for Microsoft Exchange Server backup offers many distinct advantages. 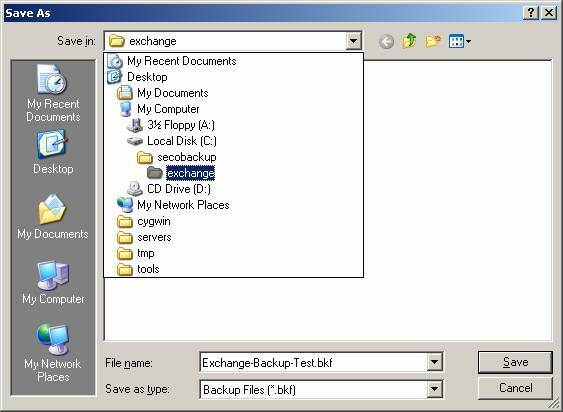 Many of these advantages make Exchange backup feasible over the internet. Large file support. 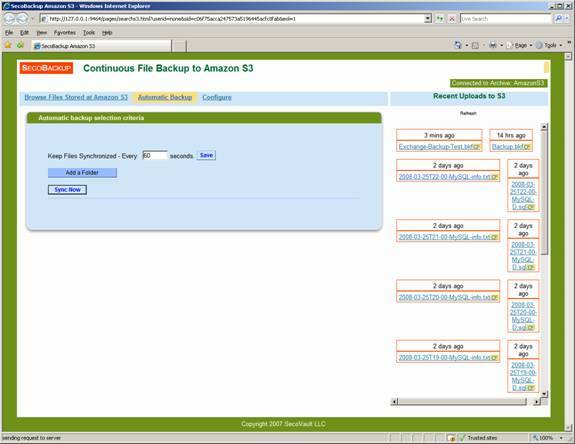 SecoBackup provides enterprise grade capabilities on top of Amazon S3 storage service. 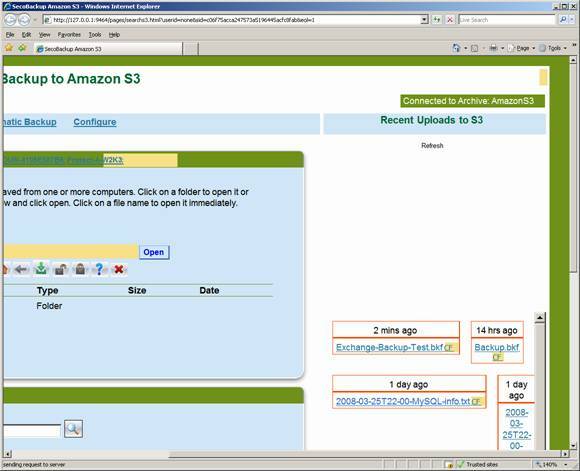 Amazon S3 is limited to 5GB file size, and uploads are not restartable. SecoBackup has no restrictions in file size (can be 100s of GB) - so you dont hit a wall if and when your backup grows to that size. 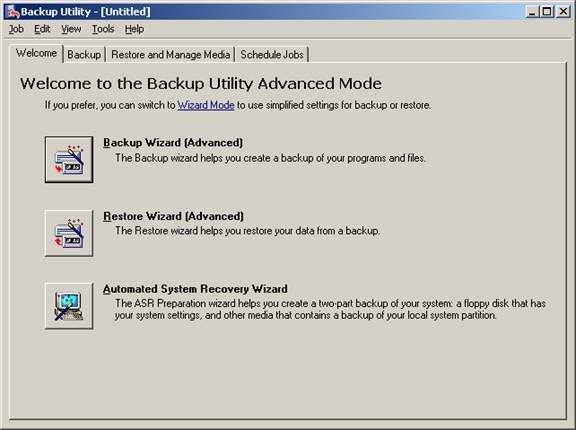 Also, SecoBackup has enterprise features of robustness and restartability of downloads from where you left of. Say, there was a network error after uploading 1230MB of data. After the network is restored, SecoBackup detects network connectivity and starts where it left off (1230MB offset in file). Large file support over WAN is a critical feature for Server Backup. Data Compression. 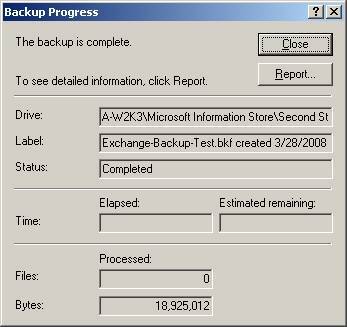 Our studies, and data reported by customers suggest that SecoBackup compresses exchange files by about 3x. This translates to a proportional reduction in cost of storage at Amazon as well as a proportional speedup in the upload speed of backup. Data De-duplication. 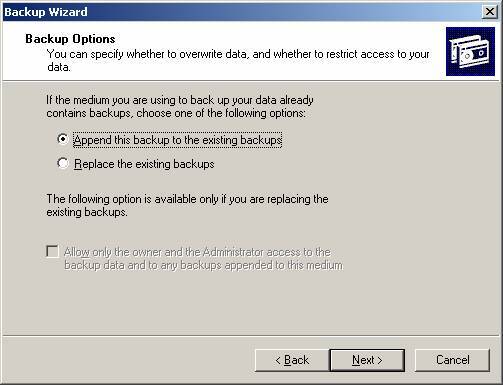 Data de-duplication is critical for enterprise backup. Daily backups can have lot of duplicates in them, either because the same emails are being repeatedly backed up, or because there are duplicate emails. De-duplication can again reduce the size of your backups and increase speed up to 10x. This technology is a must-have for enterprise class backup. 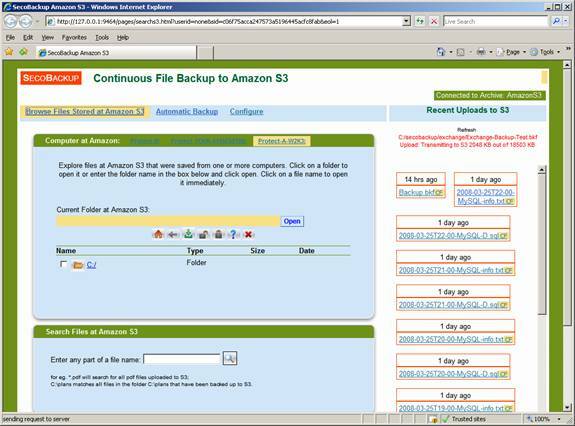 Once you have downloaded SecoBackup and completed the install, you will arrive at a page which will point you to Amazon.com's web site to setup your Amazon S3 storage account. Once you enter the activation key of your online storage account back into the SecoBackup screen, your installation will be complete. See demo to see it in action. After installation, and setting up your Amazon S3 account, the next step is to setup a local directory that SecoBackup will use for backup to Amazon S3. On the Automatic Backup or the Setup Backup page, click on the Add a folder for backup link. 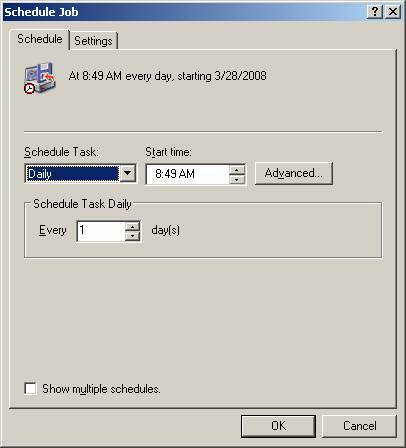 It will pop up a dialog like below (if it does not pop up a dialog, look for a window that is iconified and flashing in the toolbar below and click on it). 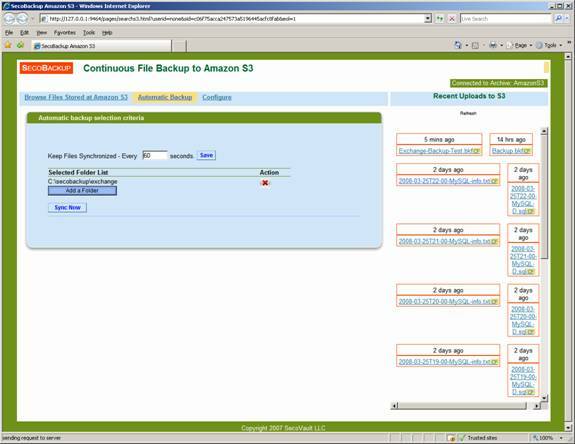 We created a new folder C:/secobackup/exchange and set it as the folder for SecoBackup to back up to Amazon S3. As you can see below, a new folder appears in the list as the folder to backup to Amazon S3. Now SecoBackup setup for Exchange backup is done. 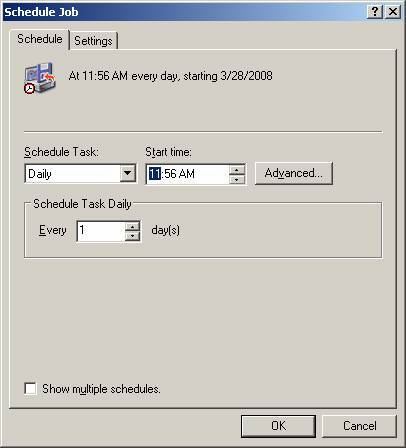 We will now create a scheduled job to perform Exchange backups into this folder. Once that is done, we will get daily backups of exchange into the designated backup folder C:/secobackup/exchange. That will in turn trigger SecoBackup to backup the local exchange backup to Amazon S3. Launch NTBackup by clicking on the Start Accessories System Tools Backup as in the graphic below. 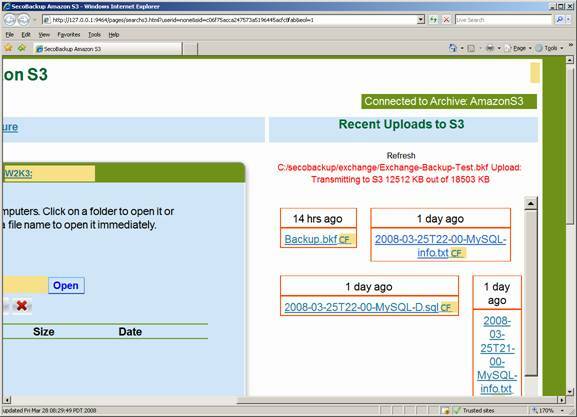 Now we will walk you through a manual backup of Exchange your first exchange backup to Amazon S3. 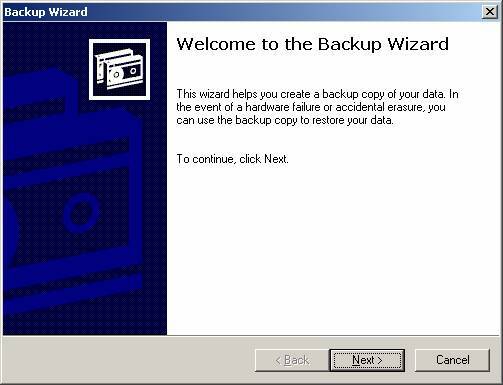 The NTBackup wizard will launch as a result of the above action. Choose the wizard mode for this test backup. 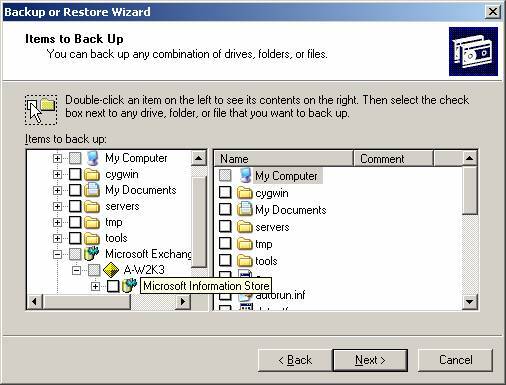 To perform Exchange backup, we will select what we need to backup, so select the Let me choose what to back up option. 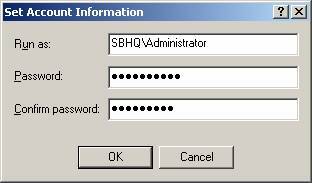 Navigate down to the Microsoft Exchange Server item, expand on it and the host name below it and then click on the information store(s) checkbox to select them. 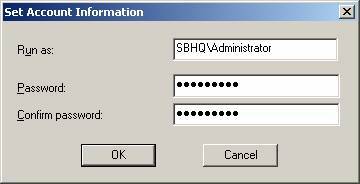 Now, provide the directory name that we used above when setting up SecoBackup as the directory where we want the local exchange backup to go into, in this case C:\secobackup\exchange. 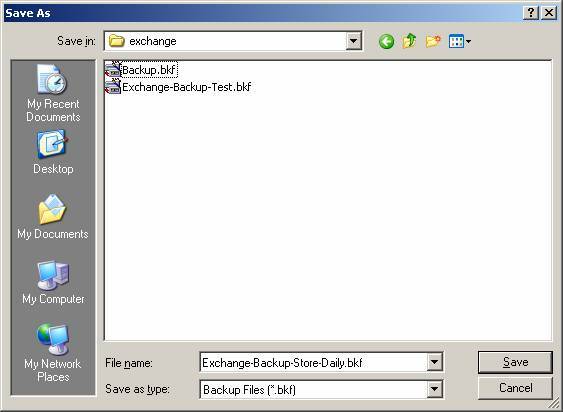 Also give it a name Exchange-Backup-Test. 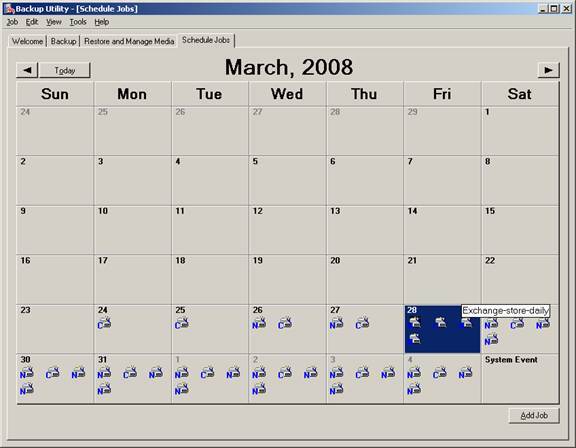 On this screen, before you hit Finish, click on Advanced tab. Select Normal for backup type. Check on verify data after backup and do not check the Disable volume shadow copy box. If you have VSS enabled on your server, leave it enabled, so that the backup is done using VSS. This is not a scheduled backup, we are testing an initial backup. Backup will immediately begin with this progress box appearing. When complete, a report like the following can be viewed. Note that the Active backup destination: is C:\secobackup\exchange\Exchange-Backup-Test.bkf. That is where the exchange backup was written. 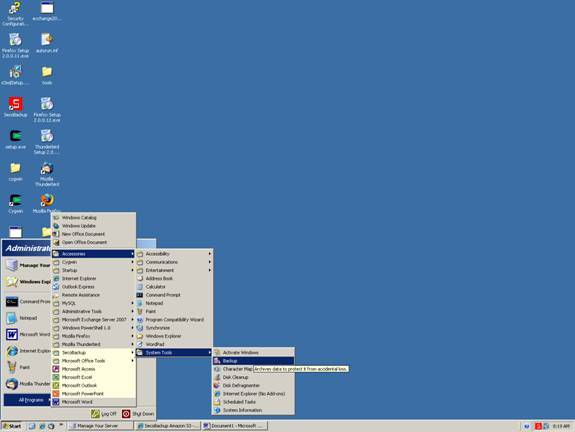 Now we will check to see what SecoBackup is doing, since it will have detected a new file in the designated directory. 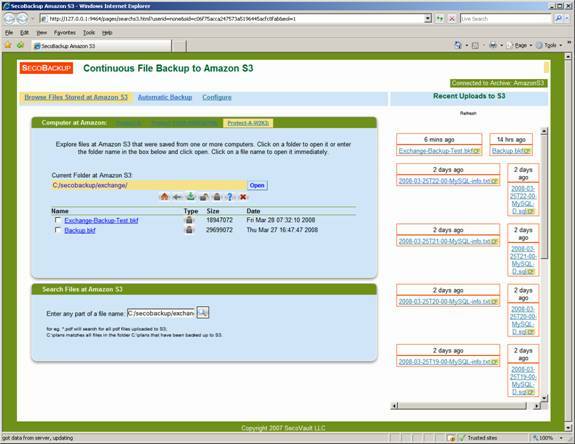 On the top right corner of the page, you can observe that SecoBackup has started backing up the newly created backup to Amazon S3. The graphic below showed a zoomed in part of the top right corner. The upload of the backup completes as is seen in the screen shot below. 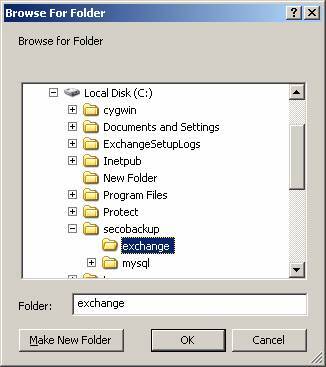 To restore the backup, we navigate on the Browse page to the C:\secobackup\exchange directory as seen below. 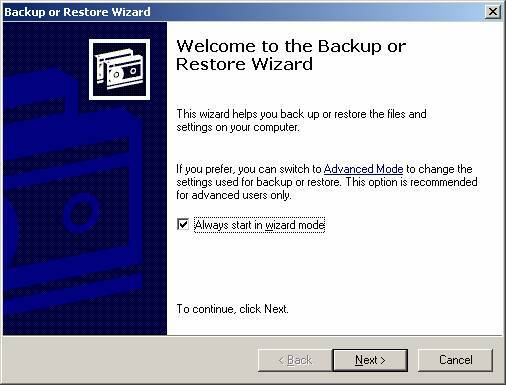 We select the desired file to restore and click on the green downarrow button to start download. Once download is complete, a popup will appear. 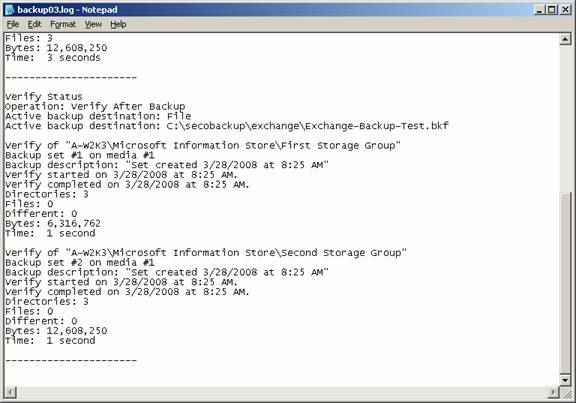 To verify that the contents are identical we compute a checksum of the downloaded file and compare it to the original as a demonstration that the files are identical.